Sometimes the easiest things we take for granted. Thanks Karl for the report. It's nice to see some folks (like the Coast Guard) can see things from a detached point of view. We can only hope than common sense can win out over growth and big politics. How about giving out j-walking tickets for all those pedestrians walking against the lights when the bridge is down and cars could be going across? There's nothing more annoying than sitting at a green light with no traffic ahead on the bridge because people think they have the right to cross when the light tells them they need to stay put. How about designating the Stillwater Bridge as a toll bridge. Based on the DOT's traffic count, a $1.50 toll would equate to $9 million a year which would pay for a $135 million dollar downstream bridge in 15+/- years. In the event that nobody can agree, close the bridge. 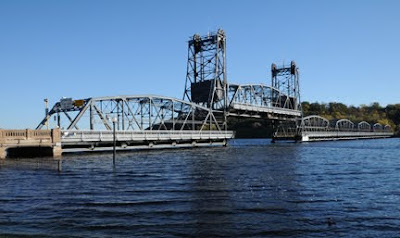 The reported 15 mile detour is actually 5.5 miles (Houlton to Hudson). Let Hudson contend with the Wisconsin commuter traffic. Just keep the bridge down and be done with it. 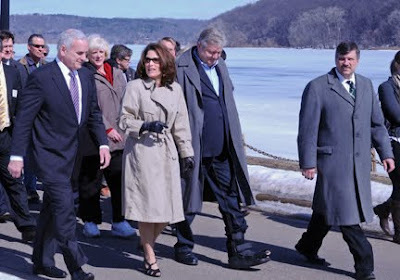 There is no need for large cruisers or the large paddle boats to have access to that part of the St. Croix when they just need to turn around after a 5 minute boat ride anyways. That area should be off limit to any boat that can't get under the downed bridge. Why not expand the I94 crossing. WisDOT has focused all there highway expansion to funnel down to the lift br, . instead of directing traffic from Somerset area to I-94. So expand I-94 crossing (6 lanes, light rail...),& at Carmicheal, on top the hill in Hudson a freeway north to feed all the commuters north. Not thru towns- Oak Park Hts, or D. T. Stillwater or Mains street Hudson. I was checking blogs and just now noticed your comment.You'll be the first one I notified when I figure this out.Keep up the great work! I love following your blog.